I hope everyone's had a good May and for those in the UK, enjoyed their bank holiday yesterday! 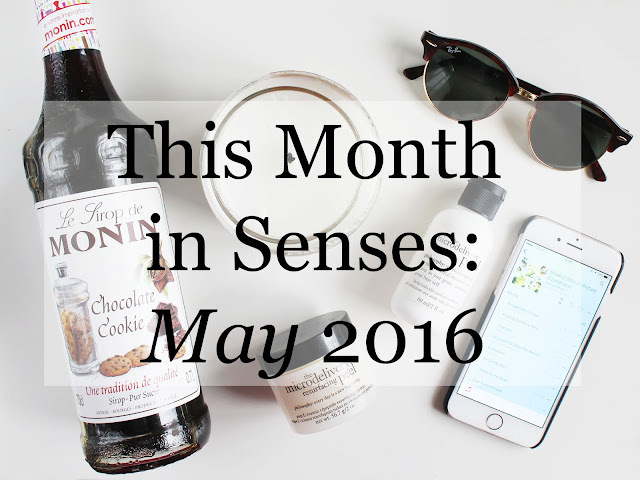 Todays This Month in Senses post is going to be a little different. I feel like, now that I'm approaching 6 months into my blogging venture, I have some learning curves I'd like to share. Plus, I have had some very exciting things happen to me recently! With regards to blogging, I'm still feeling like I'm finding my feet when it comes to posting frequency. Many bloggers do it differently; some post daily, some post weekly, etc. I used to post 6 days a week, then decided every other day, then experimented with just 1-2 times a week. I think I'm going to stick to posting every other day! So the most exciting thing that's happened in my life recently: I got into law school! I'm over the moon. I started a History degree last September at the University of Sussex, but it really didn't work out. I didn't like my course, and I was really ill at the start of the year so I missed out on the opportunity to grab that novelty enthusiasm. But I feel like it was for the best, and I'm really settled on pursuing a career in law now. I'm so happy I've successfully taken the first steps! Now, onto my May in Senses! I've been trying to cut down my dairy intake of late, seeing as my diet is practically 90% dairy. I drink a lot of hot drinks and when it comes to these, I really have a sweet tooth. So rather than opting for hot chocolates or loading up a home made latte with sweeteners, I make them with soya milk and put a couple of drops of Monin Chocolate Cookie Syrup in it. This satisfied both sweet and specifically chocolate cravings! Plus, the syrup itself is dairy free and makes my coffees (and still the occasional hot chocolate..) taste super yummy. I recently won a competition, run by Social Network Solutions in collaboration with Red Hot Sunglasses, to win this pair of Raybans! I am so in love with them. I've gotten so lucky recently winning these competitions! You may recall that in this post, I mentioned I was looking for a heavy duty, skin transforming exfoliator. And I've found it! In the beauty that is the Philosophy Microdelivery Peel Kit. It's such a good exfoliator, with very fine beads that I can really feel working. It has literally done absolute wonders for my skin, which is now 100 times less spot prone, it's softer and my skin tone is dramatically more even. If you're really looking to give your skin a good kick, trust me, try this. Let me know if you'd like to see a more in depth review of this product! I love Yankee Candles and my cousin bought me Angel Wings for Christmas. I usually keep my candles in my makeup room on a shelf and tend to light them when I'm cleaning it, or if I'm getting ready for an evening out and am going to be spending a long time on my makeup. I've just found myself lighting this one a lot recently and it smells beautiful. Okay..you're going to judge me for this one. I don't blame you. What I've been listening to most recently is the Shrek soundtrack. It makes me feel so nostalgic and it does have some really good songs on it. Plus, you really can't beat Jennifer Saunders rendition of I Need A Hero. Yaaaas gurl I love the Shrek soundtrack, the karaoke dance party is my fave!! Glad ur feeling better with the course and that it's all turned out for the best. I love these month in senses, it's soooooooo interesting, and I enjoy reading them. That cookie syrup sounds AMAZING and those ray bands are stunning!! Congratulations on getting into Law School Millie! That's an extraordinary accomplishment! You should be very proud :D Also congratulations on 6 mos of blogging. It takes awhile to set a pace you're comfortable with. Always run your blog. Never let it run you. I LOVE Yankee Candles! They always come out with different ones season to season. My favorites are around Christmas & Easter. That chocolate syrup looks great. What a wonderful idea! It definitely satisfies that sweet tooth. Great post.